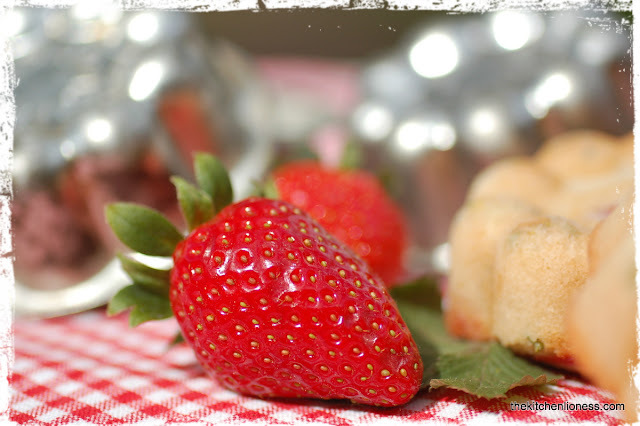 Today we are baking Financiers for the French Friday with Dorie group. It is usually said that these small French almond cakes were created around 1890, by the pâtissier Lasne whose bakery was located near the Paris stock exchange. Lasne knew that his clients who were working in the financial district, were not only wealthy but also always in a hurry. So he came up with the idea to create a small and elegant little cake that could be eaten by his clients without any utensils and without risking a stain on their clothing. But before Lasne created the financiers for his clients, however, it should be mentioned that since the Middle Ages, the Sisters of the Order of the Visitation (les sœurs de l'ordre des visitandines) used to bake small, oval, and soft delicious almond cakes. But like most almond pastries, these little delicacies experienced a rather dark period after the Renaissance. Potassium cyanide smells much like bitter almonds and it was rumored that the lovely Catherine de` Medici and her followers had the unfortunate propensity to give poisoned gifts to certain personae non gratae. Therefore, it was taboo for centuries to bake anything containing almonds. But in 1890, it is said that the talented pâtissier Lasne breathed new life into the original recipe. Lasne also had the idea (très marketing) to change the oval shape of the original small cakes to a rectangular shape to evoke the association of a gold ingot – hence, the Financiers were born! Financiers are certainly as rich as the bankers they were named for. They consist of ground almonds (100 grams), white sugar (200 grams), unwhipped egg whites (6 large), plain flour (90 grams), and a good amount of unsalted melted butter (170 grams), which can be cooked until it is golden brown (beurre noisette). Not only is the list of ingredients nice and short but the Financiers are also very easy to make. All you have to do is butter and flour about 12 financier molds, a 12-hole mini muffin pan, or other pretty little cake pans or molds and put them in the fridge so the butter sets. You melt the butter for the dough in a pan until it starts to brown and strain through a fine sieve. Set aside. Mix the almonds and sugar in a pan, stir in the egg whites and gently heat for two minutes. Add flour and butter and chill the batter overnight. Pour the mixture into the molds and bake for 15-18 minutes (depending on the exact size of your pans) until golden brown and risen in the center. Cool very slightly before taking them out of the cake pans or molds. …and delicious alongside the ground pistachios. As I do not own any Financier molds, I decided to use my tiny vintage Mondamin cake molds. At first I was not sure about being able to unmold these little cakes from these vintage molds, but a while ago, I read in one of the many recipes that I looked at that if you place the buttered and floured molds in the fridge for a few minutes before baking, the cakes will unmold easily – be that as it may, it worked. Overall, these almond cakes are very pretty and not overly sweet. They are also simple to bake, very versatile, and just perfect served with coffee or tea. And they can be made ahead and be brought to a picnic or even be kept for a nice weekend dinner party. To see how pretty the Financiers of all the other Doristas turned out, please click here. Les financiers sont de délicieux petits gâteaux! Denise, thank you - these small vintage cake molds were fun to use for this recipe - I was sure that the little almond cakes would not unmold properly, but I sure am glad that they did! Thank you very much, Rosemary! 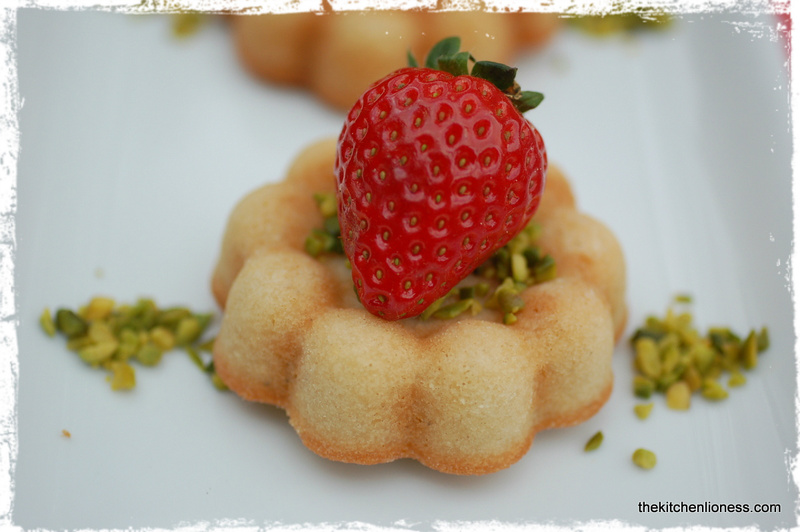 I need to make some financiers with pistachios. They look gorgeous, especially with strawberries. They look so cute Andrea! Your molds are adorable, like a semi-cannele. Have a great weekend! Paula, I must say that pistachio financiers are wonderful - I was planning to bake some with pistachio meal instead of almond meal but I have to order unsalted pistachios first, stores around here do not always carry them and they can be hard to find in large quantities, so, for this time, I just added some chopped ones to the dough. But I love pistachios and it will be worth making them with pistachio meal only, I am sure. Patty, thank you, glad you enjoyed reading about the historical backgrounds of these lovely French afternoon treats. 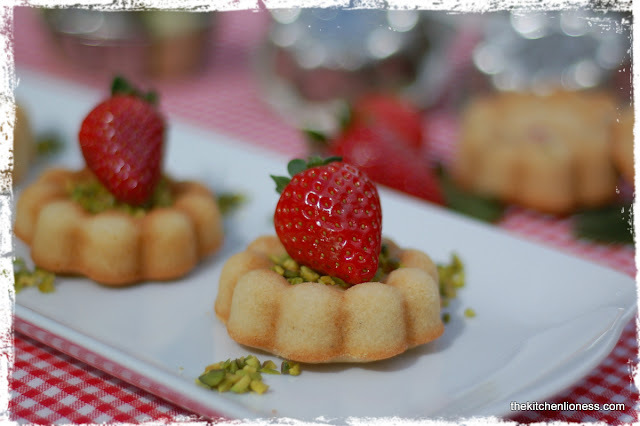 I had thought of doing these again with some rose syrup in them but now that I see the pistachios I think I shall make them again with BOTH. Lovely LOVELY treats here. Great job! Trevor, thanks for the nice comment - pistachios and rose syrup financiers sound like a wonderful combination, I have seen some with these two wonderful ingredients on a few French blogs - I tried to count the different variations on the "financier theme" but I lost tracks, no limits as to the ingenuity of French bakers it seems. Cute molds! I love how these are easy, but fancy at the same time. 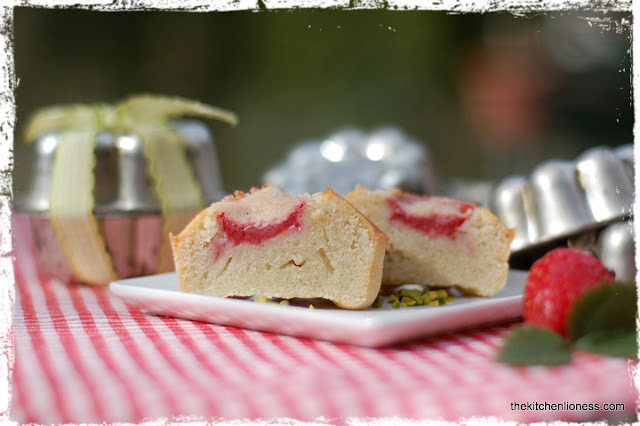 You certainly put it in a nutshell, these financiers are "easy, yet fancy" - glad that enjoyed the post. Those are the cutest mini pans, yes indeed! Lovely w/the berries. I will get out my nut grinder next time - thanks for the inspiration! Thank you very much, Amy - these mini baking pans are part of my vintage collection - sometimes it seems that I own way too many but when they turn out to be helpful accessories for my baking, then I always think that I can never own enough of them. You did a beautiful job. The cakes look delicious. I need to get busy and make them. It seems they were a hit. 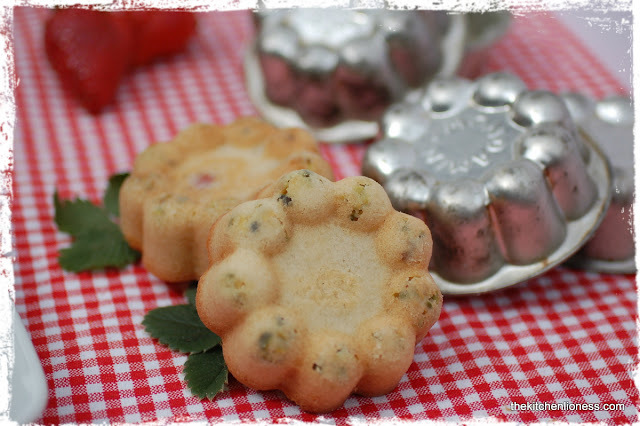 Geraldine, these little French tea cakes are not only very easy to make but they are so versatile and delicious that I am sure you and your family would really enjoy them! Beautiful! I love your little pans. They make gorgeous little tea cakes. Guyla, glad that you liked these molds! I am glad you reached back into the financier's history so the nuns would get a little credit also. Catherine de Médicis was a rascal. After reading everyone's posts, it's the chocolate financiers as well as your pistachio financiers that I want to bake. Because they are so easy and so delicious (warm), I will get to it sooner rather than later. Thanks for the tip about refrigerating the molds. I have some old molds and this will be fun to try. Perhaps this technique will work with any mold, modern as well. Andrea, I have my arrival, departure times and whereabouts ready to send you early tomorrow morning. I only have made one half-day commitment and will wait before making any more until you and I see if we can put something together. I'm under no pressure to schedule anything and would be so excited to meet you in the City of Lights. Mary, you know I always say 2credit whwer credit is due" and when I read about those nuns, I not only liked their story (and, of course, the little bit of info about Catherine de´ Medici)but I thought that I should mention it - just a fun fact I believe. As far as Paris is concerned, I will be waiting for news but it would be exiting if it worked! Your financiers look awesome, Andrea! I really want to make them with pistachios because I think the flavor combination with the almonds sound so delicious and the little bit of green in the tea cakes is just beautiful. Thank you for the extra bit of history about almond cakes. I had no idea that the smell of almonds was similar to arsenic! Elaine, thanks for the lovely comment and it is actually potassium cyanide that smells like bitter almonds - made the correction already. Hope the history lesson was not too much but I thought the story was fun. And, as one wise cooks always says, it is the story behind each dish that makes it interesting. ...and more thanks, I know that you like those vintage cake molds too and they make the prettiest of cakes! These could not be any more beautiful! What wonderful little pans you used- another Kitchen Lioness masterpiece, for sure. 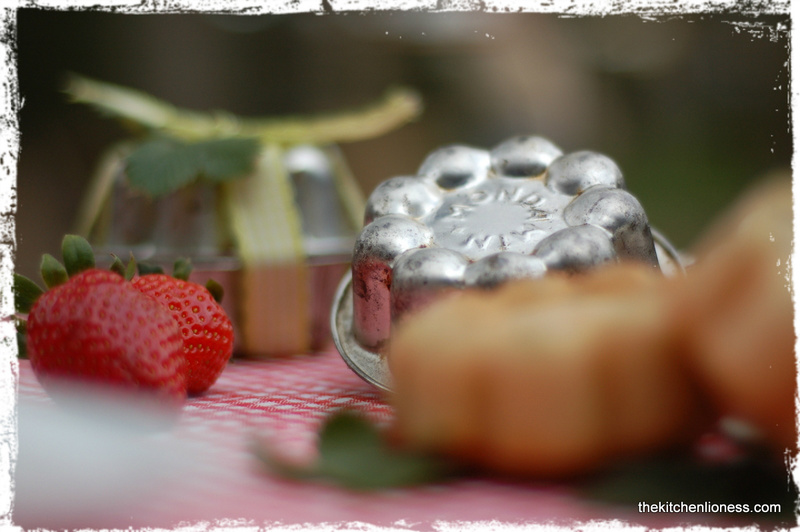 Beverly, thank you so very much for the fabulous comment - these vintage mini cake molds were a lucky find, wish I had more than six though. Thank you so much, Kristin! Glad that you like the way these little French tea cakes look like! Hi Andrea, thanks for your lovely comment. Great to be back and to 'see' you too. Thanks for the background on these gorgeous almond treats. I never knew the Medici connection. Delicious photos as always! Hester, nice to see that you are posting again - looking forward to many fun and interesting posts of yours soon! Oh, those Medicis. Middle European history was my major at University - and I wrote many a research paper about that crew. I am sure I have forgotten almost everything I studied at the time though. Those molds are stunning and your pistachio enhanced version sounds lovely. Another perfect job. Cher, yes, those intriguing Medici - their family history is certainly worth studying. And thank you very much for the lovely comment! This post was fun to put together I must say. I think Lasne would smile with approval of your financiers baked in the vintage molds. 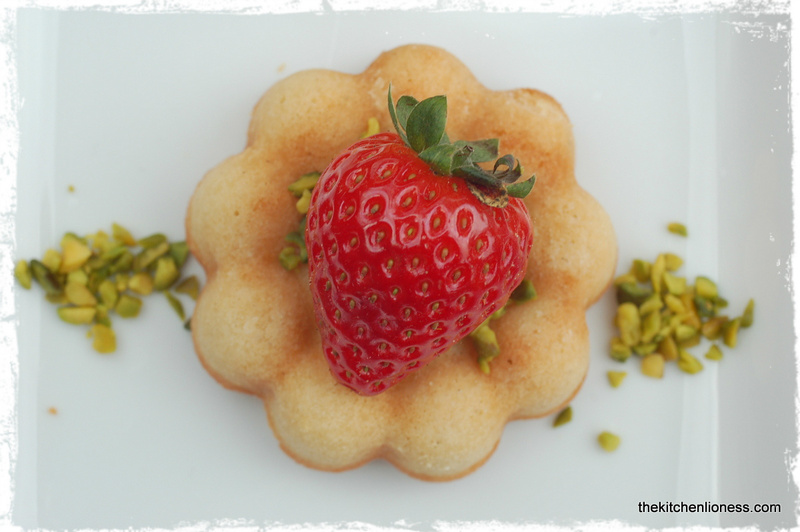 Thank you, Karen, I hope he would approve of this version of his financiers! Andrea, Love…love your gorgeous financiers! 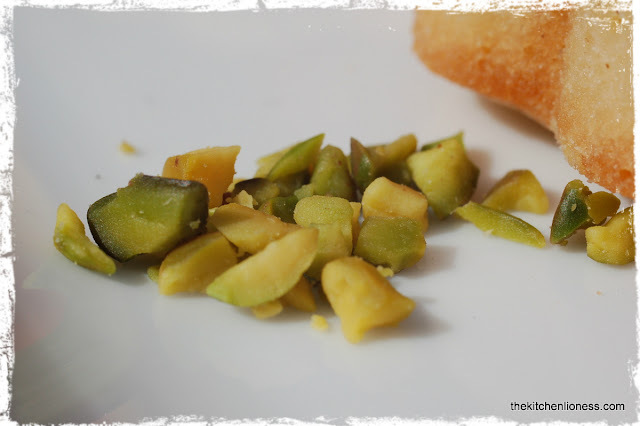 Love your beautiful vintage moulds…love the pistachios…love the history...I just love this whole post!! Beautifully done!! Did you add the pistachios to the batter? Kathy, thanks so much for your nice comment - as far as the pistachios are concerned, I added a few chopped ones to half the dough, for the other half I just added them after baking but I must say that if you add a tablespoon or two to half the dough, the financiers taste quite like pistachios, no need to go all the way and substitute all of the ground almonds with ground pistachios. Hope that helps - if you need any more info, please let me know. 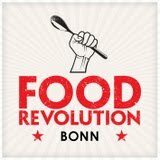 Nami, thank you for the wonderful comment - it is indeed quite interesting to see all the different interpretations of the same recipe, it never ceases to amaze me that the same recipe can lead to such different results! Would love to have you sit at our table one day! 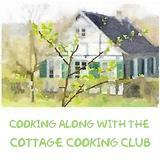 What a fun story about little almond cakes! Almond is one of my favorite flavorings in baked goods. I'm glad it's no longer taboo. Jora, thanks so much - I thought the story about almonds and baking was fun too and almonds are just wonderful in baked goods. I just got 'round to making these this week. I love your pretty cake molds and strawberry and pistachio sound like wonderful additions. 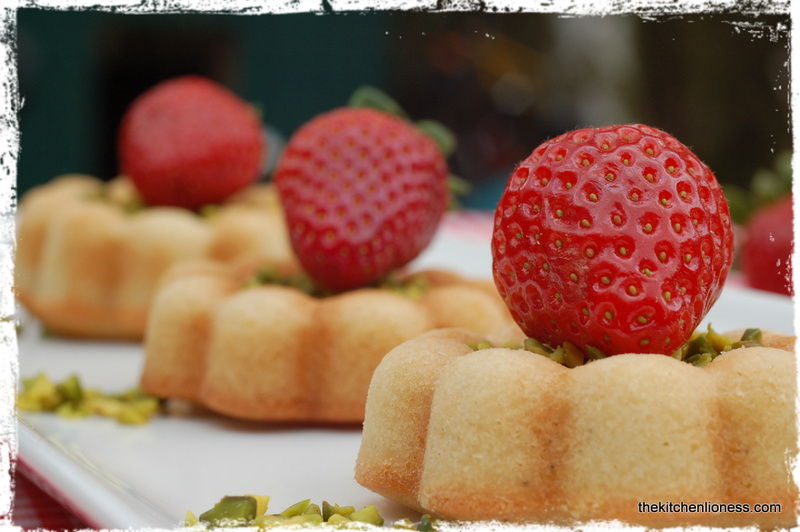 Teresa, thank you, I saw that you had a chance to bake the financiers this week - they looked wonderful. Strawberries and pistachios were really nice additions to these little pastries. I tried 1/3 of it and it worked amazingly!